After a decade meeting the palliative care needs of children and youth, and assisting families and caregivers in Eastern Ontario, the board of directors and management of Roger Neilson House began a process of renewal. The RNH board of directors established a steering committee to guide a strategic planning process and the results are available here. The past few months have been quite busy for volunteer services. We welcomed 13 new volunteers and we continue to feel very fortunate to have such incredible people looking to contribute their diverse experience and talents to the team in support of our children & families. The Volunteer Advisory Committee (VAC) started meeting and most definitely hit the ground running. As you will recall, this committee was created as a way for volunteers to provide timely and constructive feedback from a volunteer perspective to RNH. The committee members have been incredibly engaged and have already provided valuable advice on a number of topics, including: Results of the volunteer satisfaction survey; plans for volunteer week; volunteer orientation, training & support; and volunteer performance review. The VAC is finalizing its work plan, which will guide and prioritize the work for the coming months. 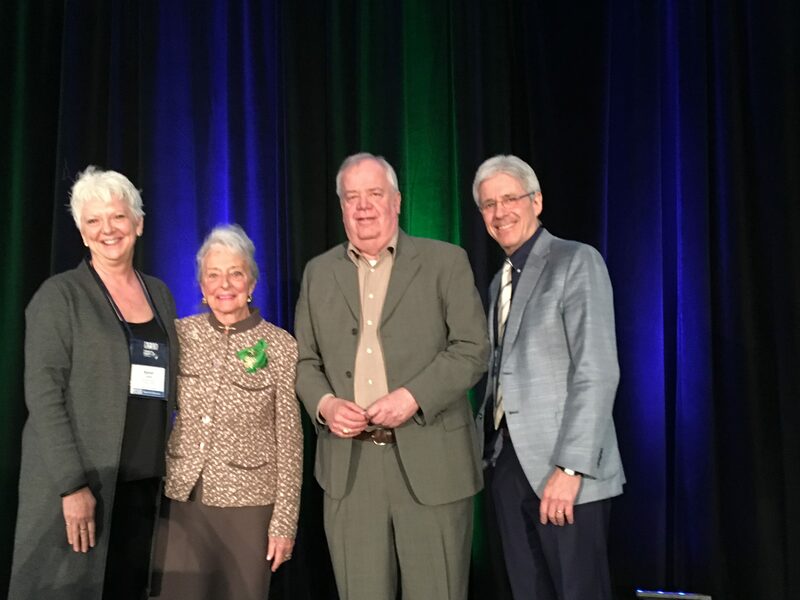 Mac Hiltz received the June Callwood award at the Hospice Palliative Care Ontario conference on April 21. National Volunteer Week was celebrated from April 15th to 21st and we had the privilege of thanking our amazing volunteers for their countless contributions. As part of the celebrations, volunteers attended a workshop at RNH – Tender, Loving, Care (TLC) for the Volunteer Carer. The presenters, Tara Cohen and Pam Grassau, led enriching discussions on self-kindness, self-awareness, and maintaining meaning in the volunteer experience. Additionally, volunteers attended a recognition event on April 19th, which was an opportunity for parents, board members, staff, and management to express their gratitude to volunteers. During this event, we unveiled a recognition plaque for volunteers having contributed 1000, 2000 and 3000+ hours. It is located near Megan Wright’s office and we encourage you to go have a look. ‘RNH Volunteers, thank you for helping to make Roger Neilson House a home – we appreciate your time, love, and support. From the bottom of our hearts…thank you, thank you, thank you! Finally, we are so happy to announce that Mac Hiltz received the June Callwood award, which acknowledges and thanks outstanding hospice volunteers throughout Ontario. Mac received his award at the Hospice Palliative Care Ontario conference on April 21. Congratulations Mac for this incredibly well deserved award! The Family Advisory Committee (FAC) continued to meet on a monthly basis through our long winter and into the spring! We provided feedback to the management team about research opportunities, bereavement programming, and evaluation practices. The committee continued work on the creation of a Family Engagement framework. During this process we were fortunate to have Morgan Cunningham and Christine Kouri from CHEO-OCTC present at one of our meetings. As co-leads in the development of CHEO’s Engagement Model for Children Youth and Families, they shared with us valuable information about how to get started, and the challenges and opportunities that we may face. Subsequently, the committee held a separate focus group meeting where we brainstormed ideas around the main themes of engagement. We emerged with some great ideas and a solid plan! Following the last newsletter, we received a positive response to our call for new FAC members and as a result welcomed two new wonderful individuals to the committee, Bertran Labonté and Chloe Benoit. We have a great balance of perspectives within the group and we look forward to working together! The committee will break for July and August and resume monthly meetings in September. The sun is here, and we are so happy about this! The summer is such a beautiful time here at Roger Neilson House as we have the wonderful opportunity to go outside and enjoy the weather. This includes our incredible and accessible patio with our super cool sail shade and giant musical instruments. Please remember to bring sun protection for your child, this includes hats, and sunscreen! We also encourage you to bring clothes that children can get wet in. Water play is quite fun here at the House. Katt and Danielle are super exited to have presented at the Therapeutic Recreation Ontario conference that took place here in Ottawa at the end of May. What a pleasure it was to present on the topic of “Therapeutic recreation in pediatric palliative care: Caring for the whole family”. The presentation focused on the benefits that therapeutic recreation has brought to our family-centered program. This summer we are pleased to have an amazing summer student join in on the fun! Please say hi, and give a warm welcome to Leah. She is here to play, support, and learn with us. Dr. Robin Williams has taken on a new role as of July 2017 providing palliative care to children and adults in Saint John, New Brunswick. Dr. Stephanie Van Zanten was on maternity leave but rejoined the team in a staff position in January 2018. Dr. Dawn Davies is joining the team in July 2018 after establishing the Pediatric Palliative Care Program in Edmonton and working there for nearly 20 years. Dr. Ben Robert will be leaving the RNH team as of June 2018 after 10 years. Dr. William Splinter has announced that as of December 31st, 2018 he will be stepping down as Medical Director of Roger Neilson House. He has been with the House since it opened in 2006 and the Medical Director of the Palliative Care Program for more than 13 years. With the recruitment of Drs. Davies and Dr. Van Zanten, he will be switching to a part-time role in July of 2018 and the search for a new Medical Director will begin in the fall. In addition, Dr. Chris Vadeboncoeur has been chosen as the Canadian Trustee of the International Children’s Palliative Care Network, and continues to be involved in national committees on Palliative Care education. Dr. Megan Doherty has also started several research projects and has been busy with international paediatric palliative care initiatives in Bangladesh as well as helping out with the Rohingya crisis.